The Lagos State Police Command has dismissed Sergeant Collins Idom, who allegedly shot dead an undergraduate of a polytechnic in Edo State, Joseph Eidonojie-Ugbeni. Idom had spent 14 years in the Nigeria Police Force before his dismissal. He was arraigned before an Ebute Meta Chief Magistrate’s Court on Monday, the same day the victim was buried at the Atan Cemetery, Yaba. PUNCH Metro had reported that the 20-year-old business administration student was on a visit to his cousin, Friday Ojah, who lived on Alape Street, Iba Ojo area. It was reported that operatives of the Special Anti-Robbery Squad were chasing a suspected internet fraudster, identified as Badoo, who had parked his car and fled upon sighting the officers. They were said to have started shooting sporadically while chasing Badoo. The Esan, Edo State indigene, who had reportedly gone out to buy a canned drink with his cousin, was reportedly hit by a bullet and he died on the spot. Our correspondent was told that the SARS operatives took Joseph’s corpse and put in the boot of the car of the suspected fraudster and drove off. After PUNCH Metro reported the incident on September 23, the police arrested, detained and dismissed the killer cop after an orderly room trial at the state command headquarters, Ikeja. He was subsequently arraigned on Monday for murder, along with three suspected cult members. The police, in a remand application brought before the court, said Idom confessed to the crime and was identified by witnesses, adding that there was no need for further investigation. His plea was not taken for the crime. The Chief Magistrate, A.O. Awogboro, ordered his remand in prison pending legal advice from the Directorate of Public Prosecutions. She admitted the three suspected cult members to bail in the sum of N100,000 with two sureties in like sum. The case was adjourned till November 10, 2016. Meanwhile, there was a confrontation between mourners and some policemen at the Mainland Hospital mortuary where Joseph’s corpse was deposited. 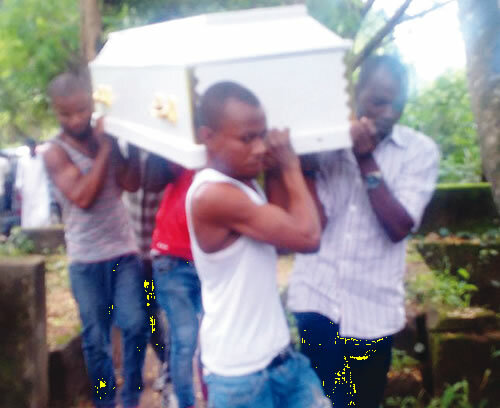 PUNCH Metro learnt that Joseph’s family were about removing the corpse for burial when a team of policemen, who had brought another corpse to the mortuary, were challenged by the family. Tears flowed when the hearse bearing the corpse arrived at the Atan cemetery around 2pm, as family and friends bid the victim farewell. His father, Patrick, called for a quick trial of the dismissed cop, saying only justice would assuage the hurt of the family. “The Lagos CP gave me N500,000 for the burial of my son and for that, I am grateful. The Officer-in-Charge of SARS also gave us some money. But we need speedy judgement. They should not cover up the case, because that will only increase our hurt,” he said. The family lawyer, Saidi Sanni, said the family would demand the payment of N500m as damages from the police. “We will institute an action at the Federal High Court to enforce the deceased’s rights. We will be suing the Inspector-General of Police for N500m damages. The boy could have grown up to become somebody of repute in the society, so his life is invaluable,” he said. The state Police Public Relations Officer, SP Dolapo Badmos, who offered condolences to the family, said the police would not condone extra-judicial killings.